the Punta Allen peninsula in Riviera Maya offers unparalleled vacation experience to travelers and adventure-seekers alike. After exploring the magnificent beaches and hidden gems of Cancun, you should be ready to go on and discover the surrounding area! 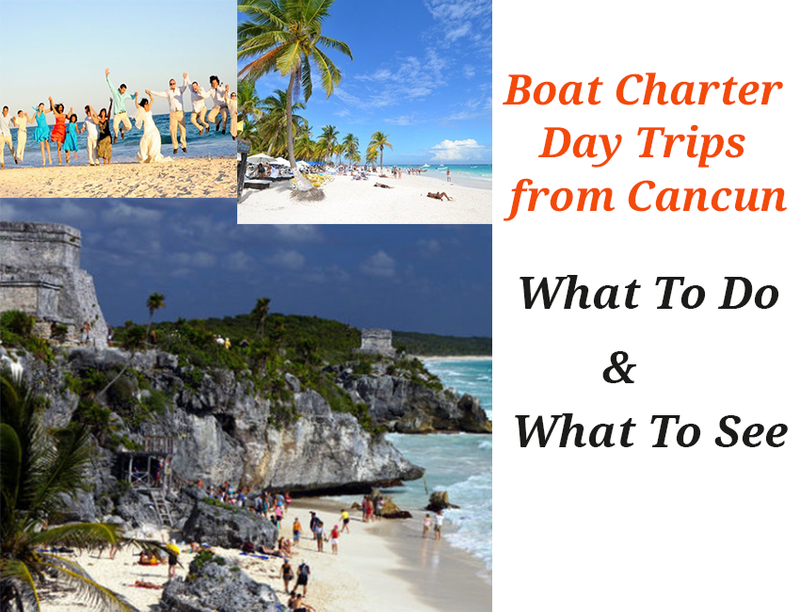 There are many amazing sites that you can easily reach from Cancun on your private boat charter day trips. Here is a list of the top day trips and excursions near Cancun. Located 20-minute boat ride from Cancun, Isla Mujeres has a laid-back & magical atmosphere. Isla Mujeres is a great escape for day trippers looking for a unique Caribbean experience. What to do and see: Rent a golf cart to explore the island. Visit tortugranja (turtle farm) to watch baby turtles. Enjoy afternoon swimming and relaxing at the best beach of Isla Mujeres - Playa Norte. Enjoy snorkeling or scuba diving at the Cancun Underwater Museum (also known as MUSA), located just off the shores of Isla Mujeres. No trip to Cancun would be complete without a visit to Chichén Itzá, the most popular Mayan ruins site in Mexico. This UNESCO World Heritage site is the best example of the Mayan-Toltec civilization. The site exhibits a multitude of ancient architectural remains including the massive Temple of Kukulkan and the circular observatory known as El Caracol. What to do and see: Explore the pyramid of Kukulkan, the Temple of Chac Mool, the Hall of the Thousand Pillars, and the Playing Field of the Prisoners. Have some fun time relaxing in the beautiful Mayan jungle. Located only about 2 hours from Cancun, Isla Holbox lies within the "Yum Balam" ecological reserve. A peaceful heaven of white-sand beaches and mangroves, Holbox is a great place to relax and enjoy natural beauties. What to do and see: Take a boat trip to see the majestic whale sharks in the surrounding waters. Enjoy swimming in the cenote at Ojo de Agua or bird watching at Isla Pasión, Yalahau Lagoon or Isla Pájaros that provide shelter to a variety of birds including pink flamingos, frigates, white egrets, double-crested cormorants, white pelicans, pink spoonbills, red egrets, gray pelicans and many more. This growing beach city is a vibrant place for a day of swimming, walking, and relaxing. With beautiful beaches, perfect weather and a welcoming ambiance, Carmen is an idyllic stretch of coast that you must visit during your Cancun vacation. Xcaret, Xel-ha, Sian Ka'an Biosphere Reserve and Xplor park are all close day trips away from Playa del Carmen. Don't miss them too! What to do and see: Enjoy people watching while relaxing on the wide white sand beaches of Playa. Spend some time exploring its charming pedestrian street Quinta Avenida (5th Avenue). Enjoy bull shark diving in the waters surrounding Carmen. Located 46 miles south of Cancun, Isla Cozumel is accessible via a 35 minute boat ride from Playa del Carmen. During your day trip to this beautiful coastal paradise, discover unique island traditions, explore its natural wonders and the San Miguel town. What to do and see: Take a leisurely seaside stroll along its charming malecón. Enjoy scuba diving in its Santa Rosa and San Francisco wall dive spots. Navigate through the Punta Sur Ecological Reserve. Enjoy souvenir shopping in the Historic Downtown Cozumel market. Don't just stay in Cancun and explore some of these awesome day trips during your vacation. Book private boat charters from Cancun for an exciting and unforgettable day trips to the places mentioned above. Have you been to these places during your Cancun charter vacation? What was your highlight? Tell us about your experience in the comments section.